Symphotic TII Corporation is dedicated to providing high quality instruments and tools for research, engineering and industry. We also are committed to providing the highest level of customer care. All of our products are directly related to our extensive experience in underwater applications, spectroscopy, lasers, and imaging technologies. In addition, we are an authorized representative for Thermo Fisher Scientific Cameras and Imagers. Soon after founding the company, we introduced our first product: the AquaRAD radiation tolerant underwater camera, which is based on this technology. These cameras are being used at nuclear energy and research facilities world-wide. Our experience with underwater deployment of radiation tolerant cameras has brought us many customers who require underwater imaging and robotics technology. Through our exclusive relationships with major manufacturers, we now offer a full line of underwater products for inspection, search and recovery, analytical measurement and research. 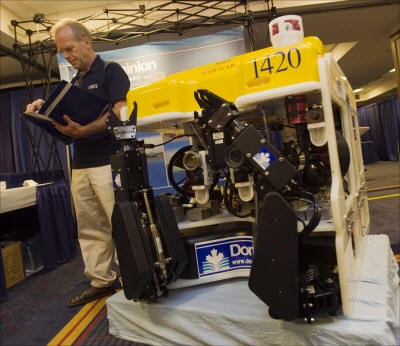 Imaging and research products including imaging and scanning sonar, underwater cameras, remotely operated vehicles (ROVs) and autonomous underwater vehicles (AUVs). We are working with Tokyo Instruments Inc. to provide a new Raman microscopy system, the Nanofinder® 30 High Resolution Raman Microspectroscopy System. We also offer high quality lasers, monochromators, and spectrographs from the Tokyo Instruments group. We have been quite successful with our Nd:YAG lasers, which have found applications in a number of imaging, spectroscopy and research applications, and our laser product line is noted for its variety, high quality, and affordability. 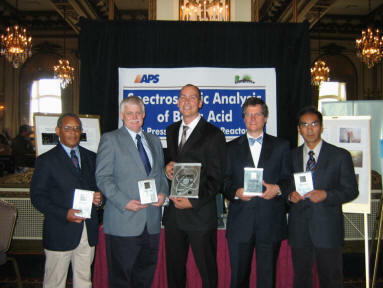 Our work with the nuclear power industry and our experience in spectroscopy has led to the introduction of the award winning InSITE Analyzer system in use world wide for nuclear power plant inspection as well as standoff explosives detection. The InSITE Analyzer has also been used in remote archeological surveys. When different musical instruments play together it is a SYMPHONIC orchestra. When different organisms live together in a way that is mutually beneficial is called a SYMBIOTIC relationship. The PHOTIC ZONE is the zone in water where sunlight can penetrate and life can be created through PHOTOSYNTHESIS. Light is associated with knowledge. The University of California uses the motto "Let There Be Light" as a reminder of the importance of creating knowledge. We created the word "SYMPHOTIC" to represent our commitment our partners and clients together to create knowledge through the use of innovative and valuable scientific and industrial instruments and techniques. The work of Symphotic TII Corporation is to bring people--our customers, staff, partners and investors-- and science and technology together to create mutually beneficial knowledge. We specialize in visualizing environmental, physical, chemical, and biological phenomena that cannot be seen or measured without special tools. Starting with our first two products, an underwater camera for use radiation environments and a laser system four use in photo-acoustic tomography imaging research, we have expanded our product offering to robotics and ROVs for delivering tools and instruments to inaccessible locations. Our motto is "Take a Closer Look". Our technology partners include Tokyo Instruments Inc.--TII--, and the letters TII represent this important relationship. Other Tokyo Instruments Inc. technology partners are include Lotis TII of Minsk, Belarus. Our partnerships with our domestic and international manufacturers of underwater instruments, imaging and laser technologies, brings us special capabilities for both the laboratory and to remotely deploy instrumentation in hostile environments. We are a California corporation with our support center located in Camarillo, California, a few miles from the Hughes Laboratory, where Theodore Maiman perfected the first solid state laser. Camarillo is in the center of the "101 technology corridor", a region of oceanographic, oil and gas, nanotechnology, life sciences, semiconductor and photonics innovation located between UCLA and the San Fernando Valley in the east, through Santa Barbara (including UC Santa Barbara) and reaching to San Luis Obispo in the northwest. Our international staff have lived and worked in a number of countries throughout the world and share a wealth of experience in various applications. We are also closely associated with the international offshore energy extraction industry and oceanographic research communities. For further information, please contact us at the phone numbers or e-mail address below.